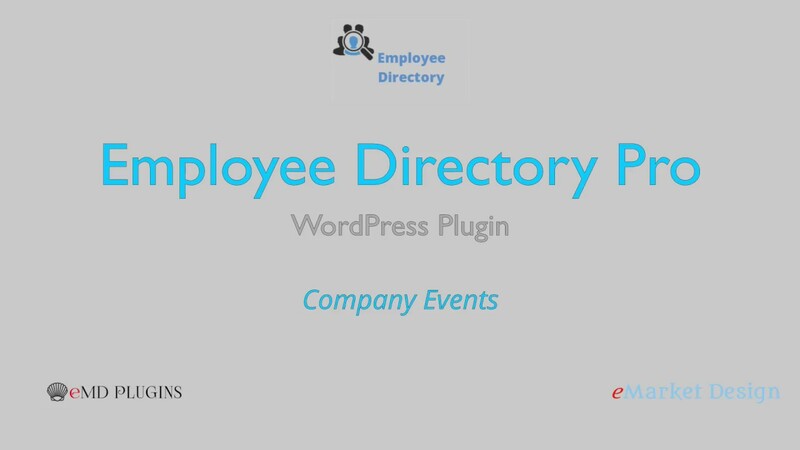 Employee Directory Event feature lets you manage your events with calendar and event pages. Events are linked to employees through groups and locations. This helps customers and employees, browsing an office location or a group tag, see the linked events as well; a great way engage them and to promote your events. It also helps you achieve a great, uniform look and feel throughout your site. Store and display company events in their own pages. Create public or private events. Private events can only be seen by registered users. Event pages have a slider with navigation for multiple event images and a configurable map displaying event location. Stacked event view is linked to locations and groups; someone looking for a certain location can also see events as well as employees working there. Multi-option event calendar view with each event linking back to the corresponding event's page. Calendar supports 20 different themes to match your site's color scheme.